FEAR FACTOR: It’s Back -Bigger and Badder! Sneak-Peek! A reality competition show original, NBC’s “Fear Factor” returns with the latest technology to put contestants through the ringer more than before. Original host, Joe Rogan, returns and quoted Executive Producer Matt Kunitz when describing the show’ scenario- “It feels like we went into a coma and woke-up and just started doing Fear Factor again.” It’s been six years since the show last aired. Executive Producer David Hurwitz said that what most people think of when they think “Fear Factor” is “big stunts, gross things, and Joe Rogan” in no particular order. “Fortunately we got all three”. Hurwitz also said, they got same brand power behind the show such as the director, producers, and stunt team. “Even the cockroaches are bigger and badder than ever. The stunt tech has come a tremendous way.” Kunitz said he used to could drop contestants at 10 feet. Now he can drop them at full speed from 100 feet up. Stunt Coordinator, Pat Romano said he threw one contestant 600 feet through the air. Hurwitz re-enforced, “the technology enables us to make this a bigger and badder Fear Factor. The show brought top Hollywood stunt guys to work on “Fear Factor”. What viewers can expect to see from contestants this season are: One young man is there competing from a “long line of cocky dudes that failed the show”. A spinning wheel reads “Head Shave”, “Spin Again” and “Tattoo”. When a contestant lands on one, that’s what they have to do. One female contestant got – guess what, the “head shave”. Another two contests are shown eating some disgusting “Fear Factor” chow and saying “we are never going to get kissed again”. 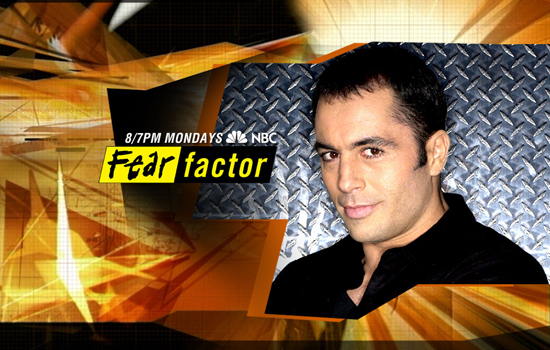 Watch the full grosstivities (yes, we just made-up a new word) when “Fear Factor” returns to NBC December 12 at 8/7 c.